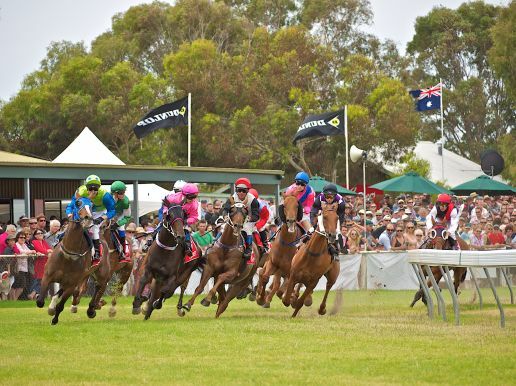 The Coopers Kangaroo Island Cup is a popular race meeting on the South Australian calendar. The Cygnet River Racecourse at Kingscote comes alive with great country racing on Thursday 18th and Saturday 20th February. And lots of other events and entertainment take place around the island over the long weekend. Thursday’s race day is a pretty casual day but on Saturday racegoers like to dress up in true racing style and enjoy the trackside entertainment, colourful marquees, fashion on the field competition and local Kangaroo Island food and wine. The Coopers Long Lunch Marquee is very popular and the menu of locally produced food will be accompanied by Dudley Wines and Coopers Beer. Many SA locals head to Kangaroo Island for the day but why not make a long weekend of it, or incorporate it into a week? This gives you the time to enjoy the carnival atmosphere and also get to explore more of what the island has to offer. Sealink offer a range of travel and entry packages as well as a range of accommodation.